Boursot's dinners normally feature a wine-related guest speaker and are held for our British customers and so of course are always conducted in English! Pretty much everything is taken care of, starting with our specially arranged crossing prices with P&O, through to a bubbly reception, followed by a four course dinner designed to go well with five more wines. Generally, we also arrange accommodation for you, so that all you need do after dinner is totter upstairs (perhaps via the bar?)! Boursot's Wine Collection is open on the Sunday mornings after a Saturday evening dinner and an exceptional 5% discount is then available on purchases of the wines that were served at the dinner. All in all, the Boursot events are designed to be highly enjoyable while offering phenomenal value. We take a private room where we normally restrict numbers to around 40, so as to retain a friendly atmosphere. Great food, great wine and great company. All you need to do is to come along and enjoy! Vegetarian and alternative food options can be provided, as long as we receive ample advance notice. If a planned guest speaker is unable to attend, we will endeavour to find another speaker and if none is available, Guy Boursot will present the talk. All our events are arranged to be enjoyable, interesting and unstuffy. Perhaps you have an anniversary to celebrate or you just want to get away for a quick change of scenery? As many of you have testified already, we make it easy for you to get away for a weekend with a difference. And of course, you are most welcome to bring some friends. Please contact us on ardres@boursot.co.uk or on +33 321 36 81 46 to book for any of our events below. Just before the end of March seems at the moment to be an opportune moment to enjoy a French Gastronomic Dinner when we will be pairing higher priced wines with a higher level of menu! Both should be memorable. On this Saturday, we are adding two additional events. During the afternoon, chef proprietor Stellio Lestienne will offer you a glass of wine and then lead you “verre en main” on a tour of his Michelin starred kitchens. As you are coming via us, there will be no cost to you. For what it’s worth, Stellio used to chef at The Waterside in Bray and so speaks good English! There will also be a tutored tasting “Ten Summer Wines” given by Guy Boursot at the hotel that afternoon. There will be a contrast of styles and Guy will explain what makes each of them different. You might also wish to take advantage of the hotel’s indoor pool and hammam which are free to guests. The all-in price of this very special 4 course dinner with 6 wines will be 95€ (currently approx. £85). To book, please click www.boursot.co.uk/secure.html and please indicate the number of people in your party and which of the additional Saturday events you would like to attend. We charge 50% of the ticket price now with the final 50% being payable on the day. You will receive a confirmation from us when you book. You can book now for any event shown above. These are the intended event dates but we also have details of other dinners planned in 2018/19 in case you wanted to check these against your diary. January is when many of us need a bit of cheering up and Boursot’s Blues Buster Dinner has been successful in achieving this over several years now. A good dinner with four courses and six wines in convivial company in a lively town, a million miles away from Blighty, should meet all your expectations and recharge you for the remaining winter weeks. Over dinner Guy Boursot will introduce you to some more unusual and surprising wines that you might not have normally considered and talk after dinner about the latest goings-on in the wine world and what effects they might bring to the market over the coming year. The Restaurant Le Cygne, close to the impressive cathedral in the old part of Saint-Omer, has long been a favourite. After a change of ownership in 2016, the quality of cuisine remains high and we will be taking the restaurant’s vaulted cellar for our private dinner for around 30 of you. The price per ticket is 76€ (about £68 at today's rate) to include 4 courses, 6 wines and all entertainment. Accommodation is inexpensive at the Hotel Ibis within easy walking distance. We have not booked any rooms but you should not have any problem on availability for when you wish to book. If there is a problem, then do get in touch and we can make other suggestions in town. This dinner may be booked now through ardres@boursot.co.uk. Our Christmas Lunch always has a great atmosphere, perhaps because of all that “vin chaud” consumed around the stalls! Our lunch will start with a bubbly reception, followed by two contrasting whites, two contrasting reds and a sweetie at the end and as usual, Guy will talk a little about the wines being served and then conclude by talking a little about the year’s goings-on behind the scenes of the wine world. The price of our three course lunch with six wines will be just 62€ (about £55) and may be booked now through ardres@boursot.co.uk. With so much high quality Rhône wine on the market and at such reasonable prices this is an area that, drop for drop, offers exceptional value for money and especially when compared with some of the more classic regions of France. Guy will talk you through a contrasting selection of wines from Lirac, Crozes-Hermitage, Rasteau and Châteauneuf du Pape and will explain just what it is that makes each of these wines taste different. Tickets are available now at 85€ per person to include four courses, six wines and all entertainment. We have block-booked rooms at the château (148€ per double/twin and 123€ per single, with breakfasts included) so please do say if you’d like a room from our allocation. January traditionally is the time for our Blues Buster dinner, when most of us need some cheering up. This year we will be at the Michelin starred Hotel la Matelote on the sea front in Boulogne where we can be assured of some excellent food, friendly service and a cosy atmosphere. There is also a swimming pool and hammam. There will be a four course dinner served with six wines and Guy Boursot will be presenting "The Warming Wines of the Rhône" looking at the continuing rise in popularity of the wines from this important viticultural area. 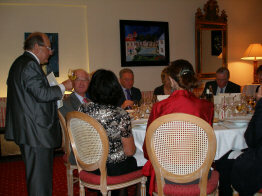 He will also tell you some background to the wines being served that evening and will explain why they taste as they do. We blocked off superior rooms at the hotel for you so please let us know if you would like one from our allocation. Your special rate will be 120€ per double room with breakfasts included, representing a significant reduction over their normal rates. The all-in price of the evening is just 79€ (about £69). So easily accessible from Britain, the town of Ardres always injects some fun and colour into an otherwise grey time of the year. As last year, the annual Turkey Festival held about 20 minutes away in Licques, will NOT be happening on the same day but on the following Sunday. So, in place of that entertainment, we will have wines available to taste in the cellars under our Ardres shop from 10.30 on the morning of Sunday 3rd and then we will go across to lunch at 12.30 at the François Premier which hardly needs any introduction, being one of the finest restaurants of this area. Being situated on Ardres’ main cobbled square, you will be in front of much of the afternoon’s action, so you may be able to watch some of it from the warmth of the restaurant! The informal three course lunch will be preceded by a bubbly reception and then accompanied by a further five Boursot wines, and everything costs just 64€ (around £56 at today’s rate). I will tell you about the backgrounds of the wines being served as well as talk about the wine world’s highlights over the last year. We suggest you "do" the Ardres Christmas Market after lunch by which time everyone’s spirits will have been warmed up! Père Noel is normally found to be abseiling down the outside of the church at around 6pm, throwing goodies to many of the local children gathered below! Saturday 21st October: 11th Anniversary Dinner at Château de Cocove. 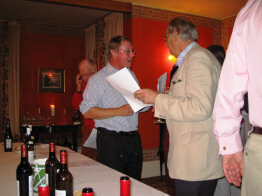 Speaker: Author and Journalist Stephen Bates: "Memorable Past, Present and Future Vintages as a Political Observer". Many of you will recall that the late Simon Hoggart entertained us as our guest speaker at three of our anniversary dinners. One of Simon's colleagues and friends at Westminster was Stephen Bates who has been a journalist and political correspondent for more than 40 years, reporting from 40 countries (and the EU) for the BBC, Daily Telegraph, Daily Mail and - for 22 of those years - for the Guardian. From the green benches at the Commons to the restaurants of Brussels, he's seen it all and remembers enough of it to make an entertaining evening. Tickets are 84€ (about £73 at today’s rate) per person and this includes four courses, six wines and all the entertainment. It will be a great evening. Saturday 18th November: Dinner at Hotel La Matelote, Boulogne sur Mer. Speaker: Frantz Vènes, owner of Château Massamier la Mignarde in the Minervois which won International Wine Challenge’s "Best Red Wine of the World" in 2005 will talk of the new methods being used in this most exciting area of the Languedoc and the difficulties caused by recent weather patterns. This sea-front hotel has excellent food and in addition has an indoor pool and spa facilities. We have blocked off a number of bedrooms for our dinner and rooms are offered on a first-come, first-served basis. Please let us know as soon as you can. Tickets are 84€ (about £73 at today’s rate) per person and this includes four courses of fine cuisine provided by the Michelin starred Lestienne family, six wines and all the entertainment. Judging by Frantz' last performance, this will be a fact-filled, informal but highly entertaining evening. Saturday 23rd September: Hôtel Chateau des Tourelles. Speaker: Guy Boursot: "How much of our tasting and wine appreciation is truly sensory?". At this four course, six wine dinner I will talk about the various means that can be used to present wines to make us believe they are better than perhaps they might be. This naturally leads into the question of how much of our tasting and wine appreciation is truly sensory. Tickets are 79€ (about £69 at today’s rate) per person and this includes four courses, six wines and all the entertainment – and it is an entertaining talk! The evening of the spring equinox is an appropriate moment to celebrate the arrival of the new season, and where more attractive to do that than the lovely setting of Chateau de Cocove which you can see on www.chateaudecocove.com? Guy Boursot will host this dinner and look at the meaning of the wine label and discuss the importance of the presentation of a wine bottle. It is an interesting and light-hearted talk which takes you through various names and several common fallacies so that in future you may be better able to judge the true contents of a bottle. Our wine dinner will have 4 courses, 6 wines and all entertainment – all for just 79€. Make this a perfect getaway weekend, for a change of scenery yet just 10 minutes away from Ardres. We have blocked off bedrooms at the hotel so please let us know if you should like to have a specially discounted room from our allocation. There will be a four course dinner served with six wines and Guy Boursot will be presenting ":A Brief History of Wine": going all the way from Greek times to the modern day. It is a talk that is always well received. He will also tell you a little bit of background to the wines you will be drinking during the evening. In addition, we have arranged that chef Stellio Lestienne, who has cheffed in several parts of the world including the Waterside Inn at Bray, will present in English a 90 minute cooking demonstration. He will show you how our dinner is put together, cooked and presented. It should be a good and perhaps useful look into some of the secrets behind creating a perfect evening! To those attending our dinner, this will be free of charge. It is particularly appropriate in this centenary year as well as with our geographic proximity to Ypres and the Somme, that we have invited our friend Nick Newman to talk about a play that he wrote with his Private Eye partner Ian Hislop. This was shown again recently on BBC2 and for those of you who missed it, here is a very brief résumé taken from the BBC’s website. It also starts on the British stage in September. "When Captain Fred Roberts discovered a printing press in the ruins of Ypres, Belgium in 1916, he decided to publish a satirical magazine called The Wipers Times - "Wipers" being army slang for Ypres. Full of gallows humour, The Wipers Times was poignant, subversive and very funny. Produced literally under enemy fire and defying both authority and gas attacks, the magazine proved a huge success with the troops on the western front. It was, above all, a tribute to the resilience of the human spirit in the face of overwhelming adversity. In his spare time, Roberts also managed to win the Military Cross for gallantry." We will enjoy a 4 course dinner with 6 wines and the ticket price will be 79€ per head to include everything. We have blocked off rooms at the hotel, so please let us know if you would like a room from our allocation. We expect this to be a popular event and so urge you to respond quickly. Frantz Vènes, the owner of the highly rated Château Massamier la Mignarde, talked about "The Grands Crus of the Minervois" as well as the highs and lows of having one of his wines elected the International Wine Challenge's Best Wine of the World in his category. The six white, rosé and red wines served during the four course dinner provided by the ingenious David Wojtkowiak, chef patron of Les Saveurs du Parc at Les Trois Mousquetaires in Aire sur la Lys, were magnificent and culminated in his top wines Domus Maximus and Les Garouilhas 2012 which we think it safe to say put a smile on to everyone’s face! Pierre Brousse-Schyler introduced the evening, which started with a small vertical tasting of Château Kirwan, 3ème cru Margaux and its second wine, Charmes de Kirwan. During dinner, we then enjoyed a further five wines, finishing with a still young tasting 2000 Château Kirwan. Pierre answered several questions about the current state of the Bordeaux market which had over-inflated with its 2010 harvest, and talked about the more pragmatic approach needed for the area’s future. We organise three main types of Event for our customers. 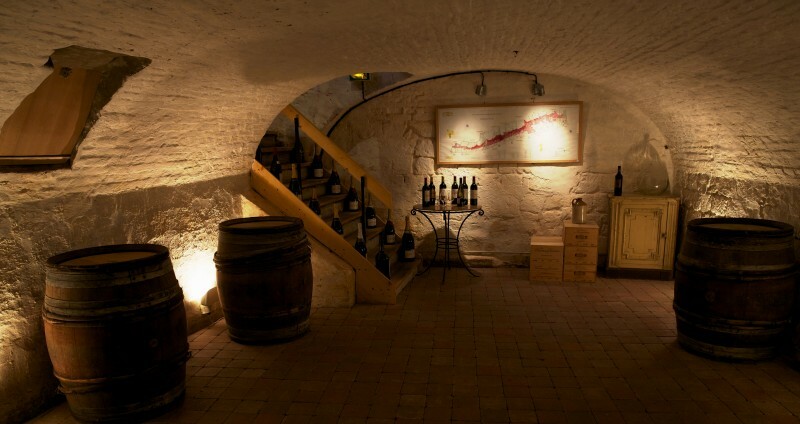 Boursot's Wine Collection has Underground Vaulted Cellars under its Ardres shop where you can entertain your friends or clients. A talk or a wine tasting can be arranged here if you wish and most customer preferences can be catered for easily enough. Local cheeses, patés, salads and French bread can be provided if you wish to complement the wines with some light food. The capacity of the cellar is 35 people, depending on event format, and costs are remarkably low, starting at the equivalent of £5 per head. Please call or e-mail Boursot's to discuss your requirements. Your group can receive a Talk on wine or a Tasting either in the UK or at the venue where you may be staying locally in France. With Guy Boursot's many years of experience, you may be guaranteed an entertaining yet informative presentation (see Testimonials on the Speaker Page). For an estimate, or simply to discuss possibilities, please contact Guy Boursot. Boursot's Wine Collection hosts Gourmet Lunches and Dinners for its customers. These are held (in English) in various well reputed restaurants in the Pas de Calais area and winemakers or principals are invited to come and talk about their wines. These Lunches and Dinners have been acclaimed as being really enjoyable and of superb value.